What is the Right Water-Cement Ratio for Mix Design? Home/ How To Guide / What is the Right Water-Cement Ratio for Mix Design? A right water-cement ratio for concrete design will influence the compressive strength, permeability and the overall durability of the concrete structure. The idea of w/c ratio is that more the value, greater is the water content in the concrete and the cement paste becomes more dilute and vice versa. Several features related to the selection of the right w/c ratio of concrete are briefly explained in this article. 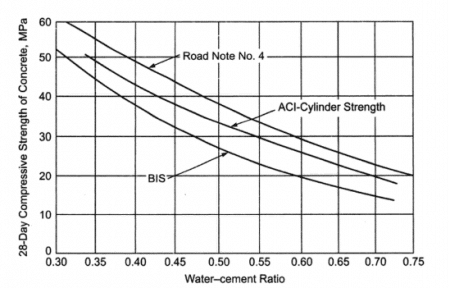 Different Water-cement ratios are employed for different concrete applications. For high-quality concrete construction, a lower water-cement ratio of 0.4 is employed. For concrete construction like driveways and sidewalks, a w/c ratio ranging from 0.6 to 0.7 is normally used. The practical range of water-cement ratio ranges from 0.3 to 0.8 that gives stiff and weak concrete respectively. Weak concrete means a fairly wet concrete. A compressive strength about 5600psi can be obtained from a concrete of water-cement ratio 0.4. This value will go down to 2000psi if a water-cement ratio of 0.8 is used. How to Choose Water-cement ratio? Based on the exposure conditions and requirements, the w/c ratio is selected either by the customer or by the authority in charge. The w/c ratio can be either taken from the available data or as recommended by the ACI or respective country standards followed. The Table 6.3.3 of ACI 211.1 gives the amount of water for concrete mix based on different slump value required and aggregate size used. Table.1: ACI 211.1 recommended water content value for different slump and aggregate size. Studies show that capillary pores start to connect with each other when w/c is higher than 0.40. When w/c is higher than 0.70 all capillary pores are connected. So most of the standards recommend 0.70 as the maximum value for w/c ratio. Higher is the aggressiveness of the environment lower should be the w/c ratio. For concrete exposed to a very aggressive environment, the w/c should be lower than 0.40. The overall concrete strength is reduced with the increase in the water-cement ratio. Addition of more water gives dilute paste that has more pores at the micro level. These make the concrete weak and results in cracks and shrinkage issues. The aggregates and cement particles take the excess water that is present in concrete. This consumption is uncontrollable if a large excess of water is present in the concrete. Hence, separate water channels are created resulting in bleeding on the surface. This creates weak zones in concrete that are susceptible to cracking under service loads. A lower water-cement ratio can contribute to a high strength and high-quality concrete. But water-cement ratio alone cannot give a good concrete. A good mix proportion and quality aggregates and binding materials contribute to good mix design. A low water-cement ratio is hence one of the factors influencing good mix design. A mix design with a lower water-cement ratio or higher cement content will give low permeability concrete. A high strength concrete tends to give a less pervious concrete. This will increase the durability of the concrete structure. 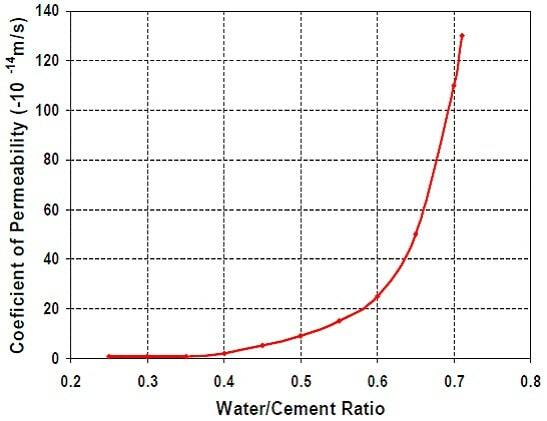 The figure-3 below shows the relationship between concrete water-cement ratio and the coefficient of permeability. 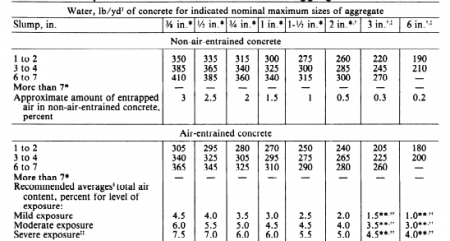 Fig.2: The relationship between concrete water-cement ratio and the coefficient of permeability.